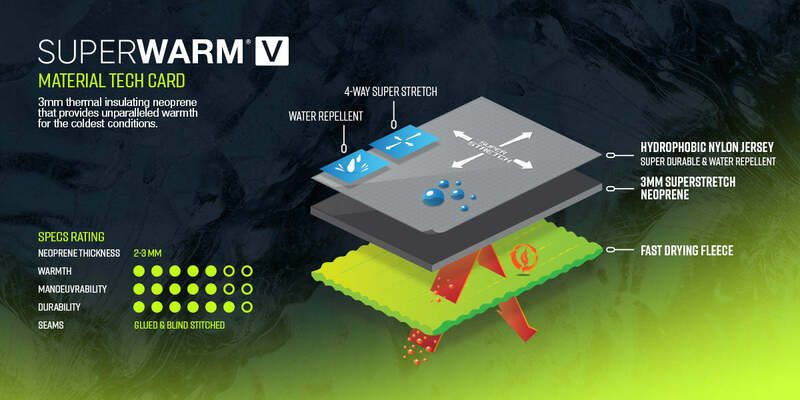 The Superwarm® V range is the next step in our revolutionary wetsuit collection. The V range offers a streamlined approach to wetsuit top design, featuring a 3D body-mapped and ergonomic fit that moves with your body. The 3-2mm neoprene construction provides great warmth in even the coldest conditions, and the targeted super-stretch panelling in the torso allows for supreme comfort and flexibility where you need it. Our V Range incorporates the same superior material and high-quality properties of warmth and durability as our Superwarm X range but with streamlined features, giving you a lower cost range for the aspiring athlete.